Are you looking for the perfect unique gift idea? you’ll find it here at Nifty Cool Gifts. Whether you’re looking for a romantic gift that will be remembered forever, or a fun gift that’s sure to make someone grin like a leprechaun with a pot of gold, the smile is what counts. And we do deliver on those! From mother to sweetheart, you’ll wow her with 24K roses that tell her what you feel. 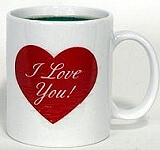 Make him or her smile with a color changing mug that changes magically when you pour the coffee. Don’t forget to join our gift list! You know those incredible people that always give fun, creative gifts that don’t even have to cost a lot but impress everyone like crazy? You can be one of them. Did we mention free prizes? Click here to learn about our free gift list! Article: Finding gifts for tricky people!